Lenka Clayton is a UK born conceptual artist whose work exaggerates and reorganizes the accepted rules of everyday life, extending the familiar into the realms of the poetic and absurd. She and writer Michael Crowe are currently writing a hand-written letter to every household in the world. Her son Otto is almost one. For New Maternalisms, Clayton performs Maternity Leave, a durational, Skype-mediated piece that invokes overlapping cycles of responsibility: government to citizen, institution to artist, artist to audience, parent to child, and audience to artwork. Maternity Leave was originally commissioned by the Carnegie Museum of Art for the 2011 Pittsburgh Biennial. Alejandra Herrera Silva lives and works in Los Angeles, and has been an active organizer, artist and teacher in the field of performance for more than a decade. Her work has been exhibited extensively, both in her native Chile and internationally. Her recent performances question bodily sensuality and materiality, with particular emphasis on gendered power relations. She is mother to three daughters: fouryear old twins Evelyn and Trinidad, and two-year old Diamanda. For New Maternalisms, Herrera performs Woman’s Challenge, a durational piece exploring the impact and affect of maternal labour. Lovissa Johansson is based in Stockholm, Sweden, where she is one half of the WOL performance duo. 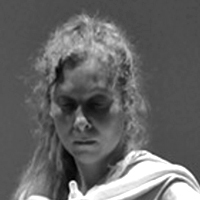 She has been working and exhibiting as an interdisciplinary artist since 1996, combining performance art, video, sculpture, installation, stage-design and sound art. Over the past six years Johansson’s work has shifted almost exclusively to performance in the form of material theatre or material music. Her daughter Klara is five years old. For New Maternalisms, Johansson performs Milky Way, a durational piece inspired by the intimacy of the breastfeeding relation, as well as an action-based piece, Jumping Lullaby, invoking the unique despair of maternal sleep deprivation. Hélène Matte is a Québec-based painter, poet and performer whose practice investigates poetry and drawings as acts of presence. Her recent work is invested in the poetry of speech, word-matter and image-gestures and has been presented at numerous visual arts exhibitions and artistic events throughout Canada, and in Colombia, Italy, France, and Belgium. Her son Lionel is six and her daughter Aurélie is three. For New Maternalisms, Matte performs L’Essence de la Vie, an action and text-based piece that offers a provocative, humorous, and sometimes threatening take on maternal embodiment and the cycle of life. Jill Miller is a performance and new genre artist based in Pittsburgh, USA. Miller presents her work with humor, curiosity and often reverence, recontextualizing objects, images and processes in order to look deeper within them. Her work has been shown nationally and internationally and is collected in public institutions worldwide. She is mother to two sons, five-year old Paxton and two-year old Argo. For New Maternalisms, Miller brings The Milk Truck, a mobile breastfeeding unit that combines guerilla theater, activism and slapstick humor, to Toronto for its Canadian debut. Marlène Renaud-B is a multidisciplinary artist living and working in Montréal. Renaud-B’s recent work reorients familiar spaces and situations through the use of uncanny juxtaposition and discomfort. She has exhibited nationally and internationally in Brazil, France, Japan, South Korea, Mexico, and the United States. Her son Armand is three years old. For New Maternalisms, Renaud-B performs Dis/sociation, an action-based piece exploring the complex ambivalence of maternal enmeshment. Alice De Visscher lives and works in Brussels, Belgium. She has been working exclusively in performance since 2006 and has exhibited both nationally and internationally. De Visscher uses her body, objects and space to create images that challenge expectations and open new meanings. De Visscher and her wife are currently trying for a baby. For New Maternalisms De Visscher presents Dream or Nightmare of Motherhood, two short performance-based videos that invoke her fantasies and fears surrounding the experiences of birth and lactation. Masha Godovannay is a filmmaker and visual artist based in St. Petersburgh, Russia. Godovannaya completed her MFA at Bard College. After living in New York for seven years, she returned to St. Petersburg where she teaches at St. Petersburg State University. Godovannaya’s work has been shown internationally at festivals, screenings and galleries. Her son Timofei is nine and a half years old. For New Maternalisms, Godovannaya presents Hunger, a performance-based, split-screen video recording her experience of the conflicts of motherhood, creativity, domesticity, and critical self-reflection. Beth Hall & Mark Cooley are interdisciplinary artists who have spent the past seven years engaged in a daily radical institutional critique of the parental roles handed to them by their well-intentioned parents. When Hall and Cooley are not learning from their daughter and struggling to figure out the principles of design that might give artistic form to a simple and satisfied existence, they can be found teaching in Northern Virginia. Their daughter Celia is seven years old. For New Maternalisms, Hall and Cooley present Safe, a performance and research-based video juxtaposing the daily rituals of child care-giving with the immensity of the information and disinfomation overload that has come to characterize contemporary maternal experience. Gina Miller is a visual artist based in Vancouver. Her recent work focuses on narratives surrounding growth: psychological, spiritual, and physical. She is mother to thirteen-year old Hewitt, seven-year old Rupert, and six-year old Harper. For New Maternalisms, Miller presents her first foray into performance, Family Tissues, a video documenting and contextualizing a social-practice performance in which she defrosts and discusses her children’s placentas with them. Dillon Paul & Lindsey Wolkowicz are New York based artists and art educators. Paul’s internationally exhibited performance and media work explores the body in physical, social, and political space. She shares a home with her partner and artistic collaborator Lindsey Wolkowicz. Wolkowicz’s drawings, installations, and found objects focus on the intersections of the body and architecture, and have been exhibited both nationally and internationally. Paul and Wolkowicz are parents to two-year old Maeve. For New Maternalisms, Paul and Wolkowicz present In Place, a performance-based video that offers a round-the-clock time-lapsed view into the shifting puzzle pieces, rhythms, and textures of the artists’ family routine. Victoria Singh is an artist and educator based in New Zealand. Singh’s work focuses on ritualized and ephemeral acts of life as art, with particular attention to conscious and unconscious relations between self and Other. In addition to her artistic practice she works as a performance art curator, most recently at Vancouver’s Western Front Society where she also published Ritual In Contemporary Performance. Her son and artistic collaborator for this project, Kurtis, is eight years old. For New Maternalisms Singh presents SON/ART: Kurtis the 7 Chakra Boy, a video that compiles documentation from the seven year LIFE/ART performance that she began on July 7, 2004, in collaboration with Linda Montano (Another 21 years of Living Art). Christine Pountney lives and works in Toronto, and has published two novels, Last Chance Texaco and The Best Way You Know How (Faber & Faber). Her third, Sweet Jesus, comes out this fall with McClelland and Stuart. She is currently exploring the world of children’s stories and will soon begin a serialization of Madeline stories on her forthcoming website. She is mother to four-year old Leo. For New Maternalisms, Pountney will be blogging in real time from the gallery throughout the event. Read her reflections at newmaternalisms.wordpress.com. © 2016 New Maternalisms and each respective artist.